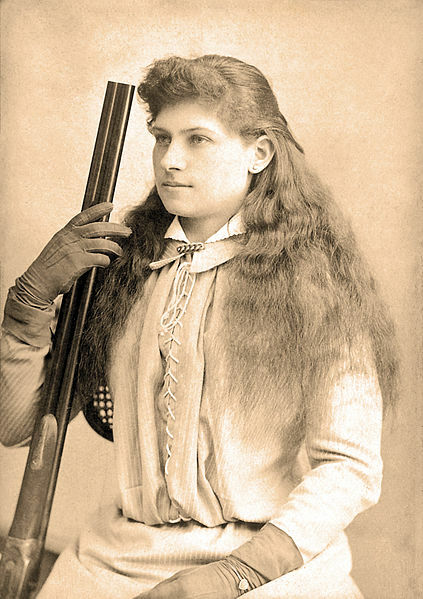 On November 3, 1926, legendary sharpshooter Annie Oakley died of natural causes in Greenville Ohio. To escape her poverty-stricken childhood, she capitalized on her extraordinary marksmanship and later joined Buffalo Bill Cody’s Wild West Show. Annie was the first female superstar in the once male-dominated profession. Phoebe Ann Moses, who later changed her name to Annie Oakley, was born in 1860. Her father died when she was very young, and Annie helped support her family by taking to the woods and shooting game which she sold to local shopkeepers. Her expertise was such that she was able to pay off the mortgage on her family’s home, an incredible boon to her widowed mother. It also led to a shooting contest with touring champion Frank Butler on Thanksgiving Day 1875. Much to the 28 year old Butler’s surprise, the 15 year-old girl bested him in the competition. The pair also fell in love and were married a year later. Butler resumed touring around the country, performing his act with a male partner. When his sidekick got sick in May of 1882, Annie stepped in and wowed the crowd with her amazing marksmanship. Butler began leaving the spotlight to his wife, and devoted his time to acting as her manager. This was when Annie adopted the surname “Oakley,” in honor of the town in Ohio. Annie met the legendary Native American warrior Sitting Bull in St. Paul Minnesota, who was impressed enough by her prowess that he dubbed her “Watanya Cicilla,” or “Little Sure Shot.” She carried this nickname with her when she joined Buffalo Bill Cody’s Wild West in 1885, where she performed for the better part of the next 17 years. Oakley knew how to dazzle her audience – she could shoot a cork out of a bottle from 90 feet away and snuff out candle flames – just for starters; between her skill and charisma, she had no problem packing them in year after year. Buffalo Bill’s Wild West toured England in 1887 for the Golden Jubilee of Queen Victoria, who called Oakley a “very clever little girl.” By the time the Wild West returned to Europe in 1889, Annie was a bonafide superstar and received top billing on the tour that ran through France, Italy and Spain. By the turn of the century, Oakley and Butler were hoping to travel less often. When the couple were involved in a serious train accident in 1901, Annie retired from Buffalo Bill’s Wild West Show. Instead, she gave shooting lessons at exclusive clubs and even did a little acting. Frank took a gig with the Union Metallic Cartridge Company, which allowed the couple to hold shooting exhibitions while endorsing the company’s product line. Frank and Annie began construction on a home on Maryland’s eastern shore in 1912 and welcomed a new addition to the family, their beloved dog, Dave. The house was designed so Annie could step on the roof and shoot game at the nearby Choptank River. They planned to stay at the house for the rest of their lives but after Annie was in a serious car accident in 1922, they decided to return home to Ohio. Annie’s health steadily declined over the next four years. On November 3, 1926 she died at the age of 66 from pernicious anemia. Frank, her husband of 50 years, was so bereft he stopped eating, and followed his wife to the grave 18 days later on November 21. They are both buried in Greenville, North Carolina. Annie Oakley will always be remembered as an American folk hero and icon. In a male dominated profession, she never lost her sense of propriety while self-assuredly proving that she could easily beat any of them on the shooting range. Jumping Badger was the birth name of famed Indian chief Sitting Bull. His father’s name was Jumping Bull and his mother’s was Her-Holy-Door. Perhaps when you have a title with “..and her guns” in it you might want to mention what firearms she used? Yes, very poor form to have a title that doesn’t match the article. In the article, “This Day in History: November 3rd- Annie Oakley and Her Guns”, it is stated that Annie Oakley is buried in Greenville, North Carolina. She is instead buried in Greenville, Ohio.